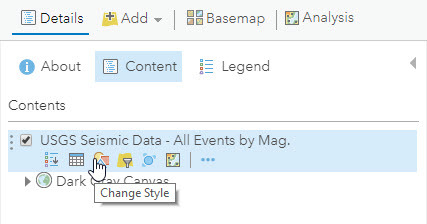 Have you ever had multiple fields in your data that you wanted to display as one unified symbol in ArcGIS Online? Arcade makes it easy to take any fields in your dataset and combine them into one symbol on your map. The steps are outlined below using Esri’s Live Feed earthquake data. At the end follow the link to Earthquake Mapping Part II: The Cartography of Time, Magnitude, and Alert Levels which dives deeper into the cartographic riddle for displaying hundreds of earthquake symbols on a map. This Live Feed is updated every five minutes and has fields detailing individual earthquake information including an event’s ID, Hours Old, Magnitude, Location, and PAGER Alert Level. The first 30 seconds of the 6.9 Richter magnitude Loma Prieta earthquake that struck the Bay Area along the San Andreas Fault in California on October 17, 1989. 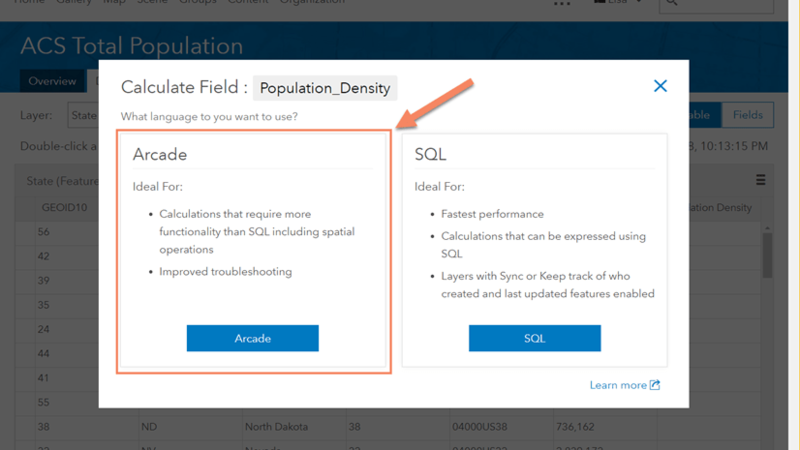 All hosted feature layers in ArcGIS Online contain an attribute table. Attribute tables have rows (features) and columns (fields) that store the data for that layer. What’s Important for Mapping Earthquakes? 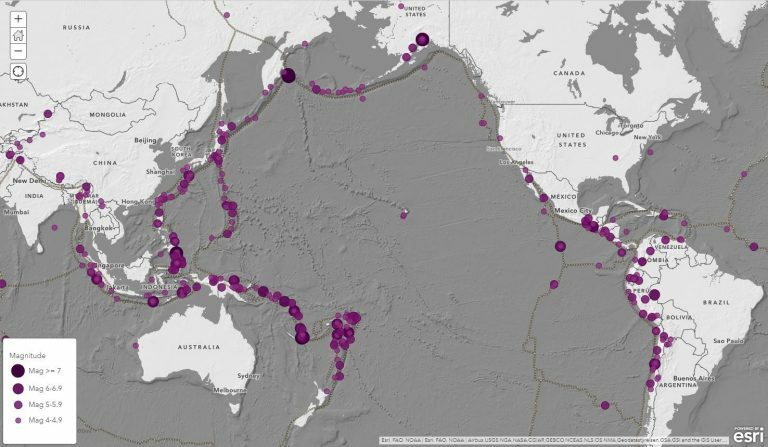 It’s hard to differentiate the earthquake’s time, size, and severity as you flip between the maps and yet we need to be able to see them all. Is a 6.5 magnitude earthquake important? It depends right? When did it happen? Where? In the middle of nowhere? A populated area? Are roads and buildings damaged or are people hurt? We want to display each of our three fields genuinely, but also honor and respect each attribute’s contribution towards understanding of the complete dataset. Compelling map symbology requires knowing your data fields, evaluating each one’s importance, and being able to interpret them together in a way that will uniquely, and beautifully, tell their story. Without any additional data processing we will use Arcade to join these fields together to form new sets of information for our map. 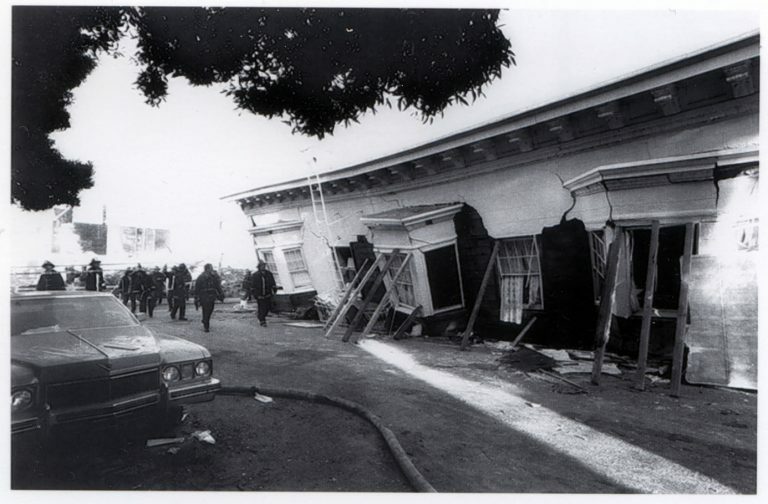 Damage to apartment building at Beach and Divisadero Streets in the San Francisco Marina District from the 1989 Loma Prieta Earthquake the week of October 17, 1989. 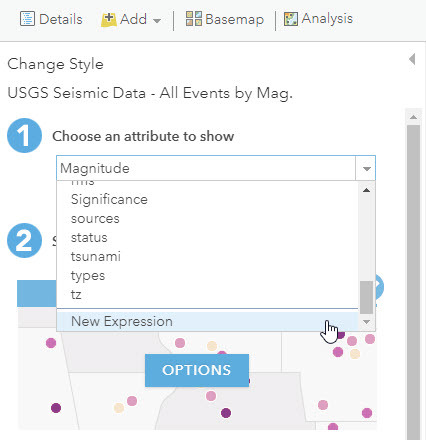 Esri’s Earthquake data is located here (copy the URL on the bottom right of the page). Add this as a Web Layer to your ArcGIS Online map. Begin by filtering out all of the smaller earthquakes that are < 4 magnitude. 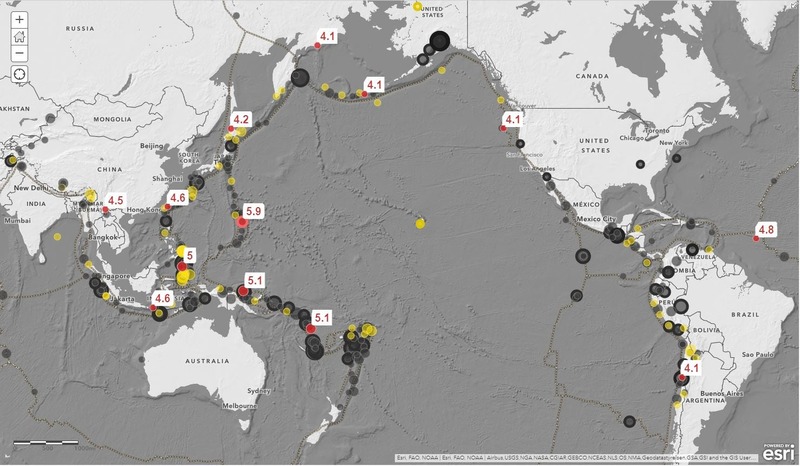 Since earthquakes that are within the range of 4-4.9 magnitude (See The Modified Mercalli Intensity Scale) are detectable by people outdoors and are strong enough to wake some people up at night, this is a good threshold for representation on the map. 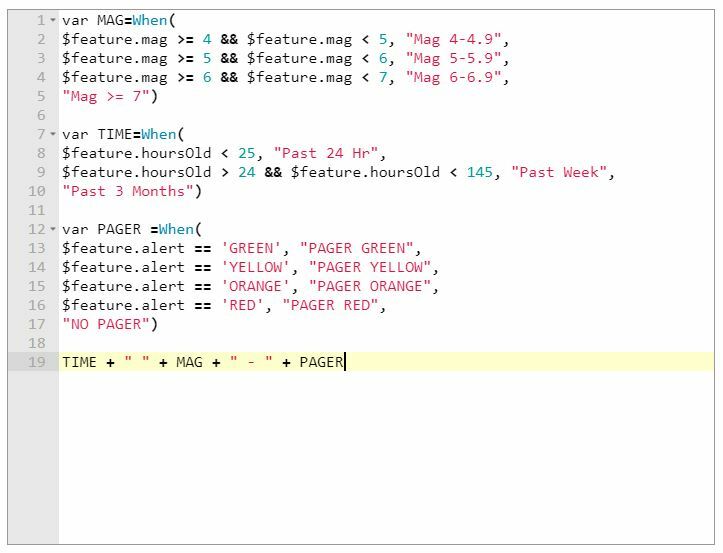 See this blog about applying filters. Click to “Change Style” of the layer. Under “Choose an attribute to show” scroll to the bottom and select “New Expression”. Please Note: When you copy the above text and paste it into Arcade you will have to modify the ‘single’ and “double” quotes. They will come in formatted curly and you need to make them straight. 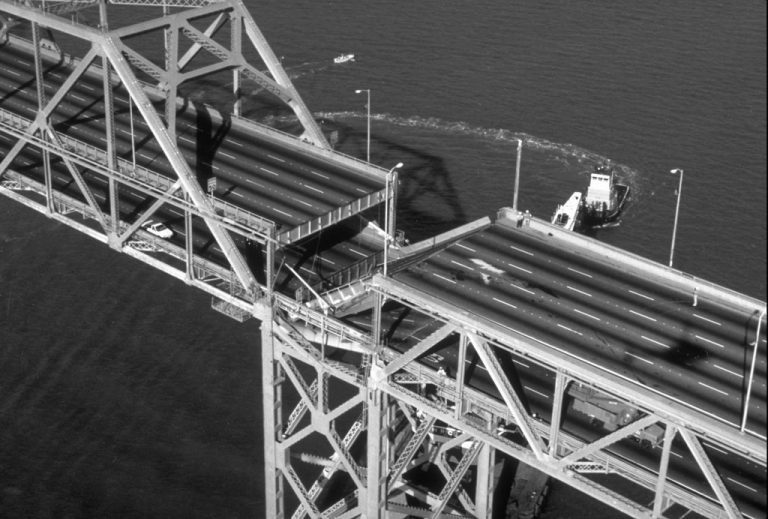 One 50-foot (15 m) section of the San Francisco–Oakland Bay Bridge collapsed during the 1989 Loma Prieta earthquake. 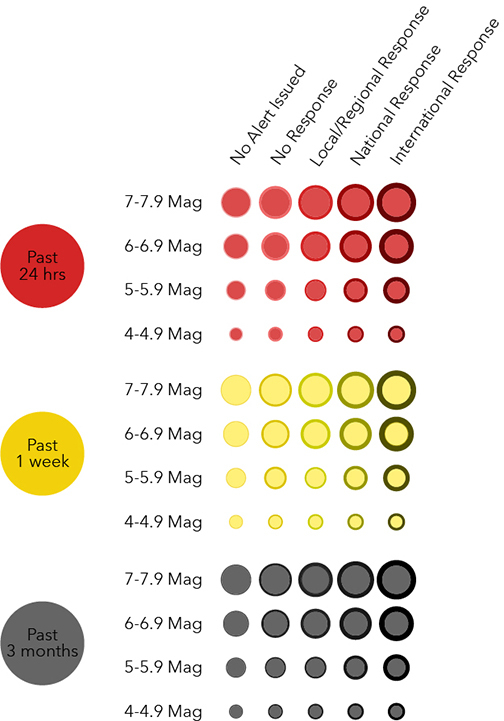 We have our expression to classify the earthquakes by Time, Magnitude, and Alert Level. Watch the short video to see how to apply it and rearrange the new classifications. 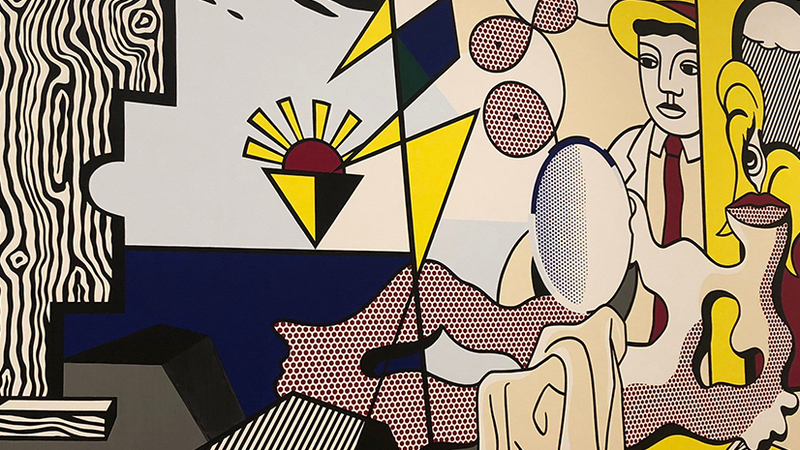 Since we have just combined three attributes together, and given what those are, you might be thinking that this is going to produce a lot of results. You are right! This will give us 60 possible combinations! Without a doubt mapping earthquakes can get complicated quickly given the various Time, Magnitude, and Alert Level combinations! Combining fields in Arcade is a great way to visualize your map dynamically. This is handy when you have data that has hundreds of points and also has the potential for 60 symbols. 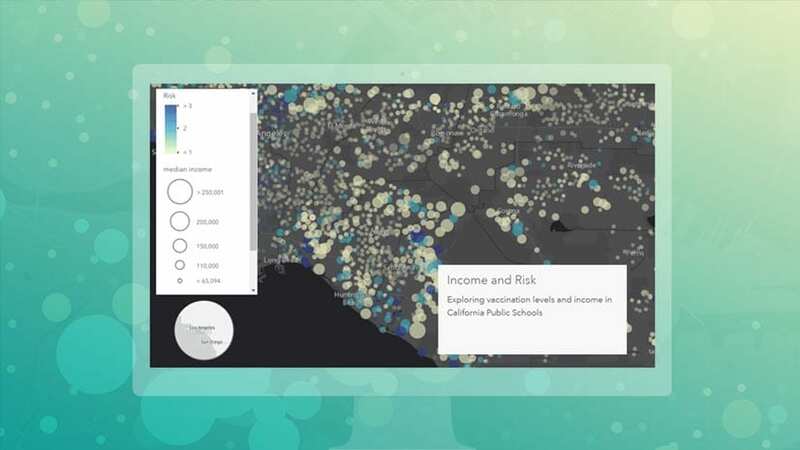 There are resources available for using Arcade in your ArcGIS Online maps. You can start by visiting the Arcade documentation page, Esri Technical Support, or check out this blog on Smart Mapping for other Arcade examples. There are also a few more linked blogs below. Keeping the symbols simple and intuitive are important for this map. 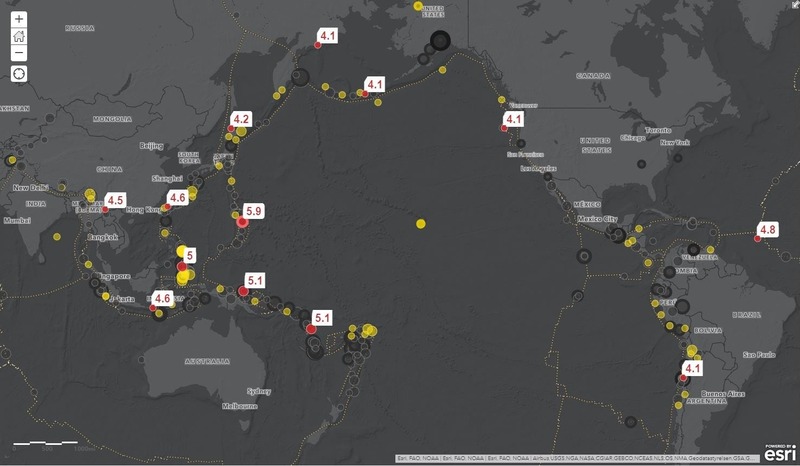 Follow this link to Earthquake Mapping Part II: The Cartography of Time, Magnitude, and Alert Levels to find out how this Arcade expression gets symbolized in this complex earthquake map! The final map is here and the app is here. Here are a couple of sneak peeks below. I would like to thank Paul Dodd for his help with the Arcade expression. Paul’s knowledge of computers and Esri remind me of wizardry and I have tremendous gratitude for his time and thorough explanations. By the way…I grew up in the San Francisco Bay Area in California and I experienced the devastating 1989 6.9 magnitude Loma Prieta earthquake. I brought that experience to this project and it was a frame of reference for me.